In 2012, I wrote a post for The Thesis Whisperer blog on the Cornell Method of note taking and how effective I thought it was. I’m still using the Cornell Method, but 5 years later, I have some improvements, so I thought it was time to update it. This is the first in a series of Second Edition blog posts–top posts from the archive of the blog that talk about techniques I’ve been using regularly for the last 4 or more years, that are worth publishing in a new and updated version. I hope new and old readers of the blog find them useful! I take a lot of notes. When I was doing my PhD and I was taking thousands of pages of notes, I took them by hand. I tried using a computer, but there are so many things that are really hard to do on screen (drawing an arrow to make a connection between points, for example) that are really quick on paper. Also, you only need one hand to write notes, but two hands to type. And that free hand comes in useful for holding open books, grasping coffee cups, or stuffing your face with Gummi bears. For school, I learned to make excellent handwritten notes, it’s been a habit I’ve kept up. The reason I think it’s so hard, is because when you take notes you focus your attention on the text (or case study, or thing under your microscope). You focus towards that thing. Then you have to turn completely around and face your thesis, and write towards that instead. Figure 1: Writing notes and writing the thesis mean you have to focus in opposite directions. Even if you see note taking and research as a cycle of reading and writing, you still focus towards the research, then towards the draft, then towards the research, then towards the draft. I’ve tried lots of different ways of getting around this. For an article I wrote in 2011, I just typed the quotes straight in. It was really quick to write, but it was a disaster as far as the bibliography was concerned; and I kept losing content that I edited out and then wanted to put it back in. The Cornell Method was invented about sixty years ago (see Walter Pauk’s 1962 classic How to Study at College, now in its tenth edition), though I only found out about it in 2012. It incorporates a lot of what I was doing already—providing spaces for notes, and margins for reactions, connections and comments. But it takes it further, and adds some very cool functions. Firstly, the template gives you less space to write notes. You aren’t supposed to record everything you see, or even everything that is interesting. 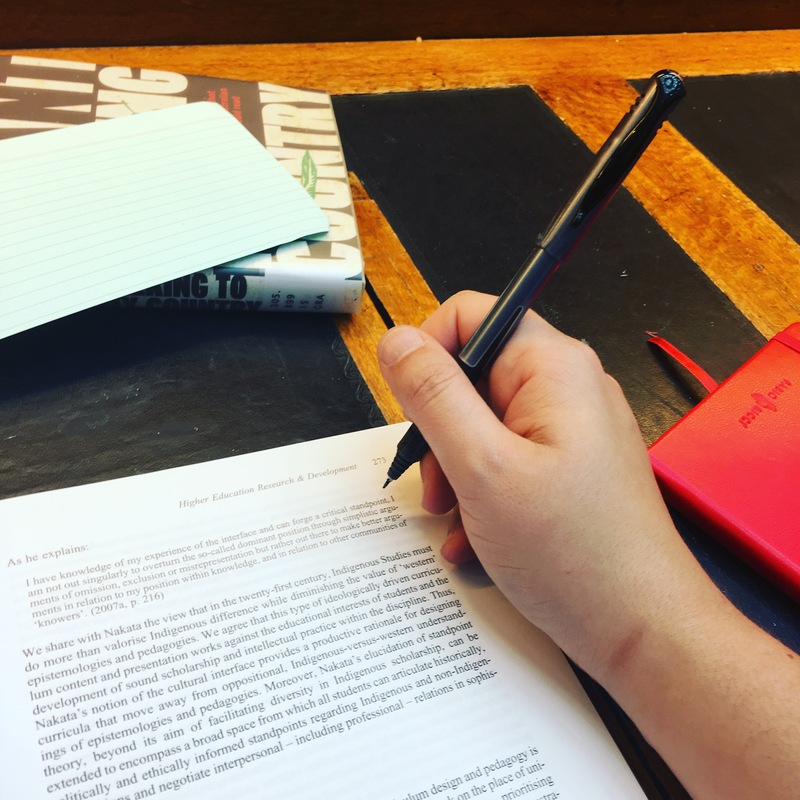 Having fewer lines to write notes encourages you to be selective—just to chose the quotes or paraphrases or details you expect to include in your thesis. And it’s so quick. In under an hour, I went from opening the book for the first time to producing these notes. Figure 2. My notes on Judith Wright, The Moving Image, for an article published in British Writers. When I sat down for hour of Shut Up and Write that week with only this page of notes and my laptop, I didn’t have to spend any time thinking about how I would turn my notes into my writing, because my notes were already facing in the right direction. My notes were already my writing plan, my topic sentences, my argument. In 50 minutes, I produced 1200 words. That’s a full draft of the whole section. I think that’s a win. I have a new template that you might want to use, to try it for yourself! You’ll see I’ve split the Page Number column from the Key Themes column, for example and tweaked the size of the various sections. I build this template in Excel, so if you start using it and think you’d like to customise it for yourself, go ahead! Evernote’s Professional Notebooks use a reverse Cornell style layout, which I use for taking notes in meetings, but which you could use for your research. Anthropologists in the field, for example, often find this is the best way to take notes reflectively so they are then able to turn those notes into writing when they come home. Do you have a Cornell Method model that you love? Have you managed to create an online note taking system that uses a Cornell style system? Let me know! Many thanks, very useful. I’m about to use this method for my PhD. As I’m familiar with Microsoft Office products, I use OneNote and even found an online template to use. I prefer OneNote over paper as I can synchronize across all my devices (PC, tablet, phone). I also use Siri on my phone to dictate some of my notes, rather typing. OneNote seems to have better relevant functionality than Excel as it specifically was made for note taking, eg one can include drawings, links, group notes etc. Thanks! Excel makes it easy to draw the lines and print it out–though I know other people use it for actually taking notes. I had a look online–and there’s quite a few templates out there! Which one do you use? Thank you! That’s awesome work! In this method, do you take notes on each page you read? So that one page of reading yields one page of notes? That is, is there a correlation between the amount of Cornell notes you take and the number of pages you read?